Swedish Business Council in collaboration with the Arabia CSR Network are pleased to invite you to an exclusive seminar with Ms Habiba Al Mar’ashi, president and CEO of the Arabia CSR Network. The topic is UAE’s national CSR trends, current practices and how you can do CSR in the local market. Can CSR be done despite limited resourses and small budgets? And how can you localise your multinational CSR activities? The presentation will be followed by an open discussion/ Q&A. The event is for members only and free of charge. Thank you for registering! We look forward to seeing you there! Habiba Al Mar’ashi is the Co-founder and Chairperson of Emirates Environmental Group (EEG) and the President/CEO of Arabia CSR Network. 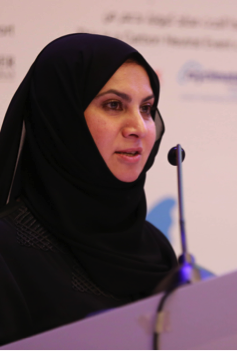 She played a key role in the growth of the EEG, which is an active multi-sectoral organisation established in the UAE in 1991. EEG has successfully brought the government, private sector, academia and the community under the same banner. Under her leadership, EEG became the first environmental NGO in the world to receive an ISO 14001 certification in 2001. EEG is also the only organisation of its kind in the GCC, with accreditation with two highly esteemed UN bodies, namely the United Nations Convention to Combating Desertification (UNCCD) and the United Nations Environment Programme (UNEP) Governing Council. EEG is a member of the UN Global Compact and hosted the Local Network for the Gulf States from 2008-2015. EEG is a member of the International Union for Conservation of Nature (IUCN) since 2008. These accreditations ensure the Group’s involvement and participation in international environmental discussions, programmes and campaigns. Through her leadership, she initiated the first corporate social responsibility (CSR) network in the Arab Region in 2004 as the only multi stakeholder forum with local and multinational entities. She initiated and rolled out the first Corporate Social Responsibility Award for the Arab World. She was the first Arab woman to become a board member of the UN Global Compact from 2006 to 2013. She was a member of the Global Reporting Initiative (GRI) Stakeholder Council for two terms from 2012 - 2017. Furthermore she was unanimously elected as the global NGO representative to UNEP’s Major Groups Facilitating Committee and served from 2013-2015 inclusive. Apart from this she is one of the founders of the Emirates Green Building Council (EmiratesGBC) and serves as the Vice Chair and Treasurer to the council. Mrs. Al Mar’ashi is also a member of the Membership Committee of the World Green Building Council. Mrs. Al Mar’ashi is also on the advisory committee of the DNV Certification Advisory Board for the Middle East. She is a member of the Patronage Committee of myclimate – an international climate protection organisation based in Switzerland. Mrs. Al Marashi is involved in many leading initiatives on environment / sustainability, CSR, women and development at the national, regional and international levels. She is a recognised representative and spokesperson for West Asian Arab Women at high ranking international summits. Mrs Habiba Al Mar’ashi is an appointed jury member of several local, regional and international Technical Committees of coveted awards.